Last week I met some friends for dinner at an Italian restaurant in San Francisco. We ordered a salad appetizer to share, which was topped with squash cooked in brown butter. The salad was good, but honestly, I could have eaten a pound of that brown butter squash for dinner and been happy. Since squash pretty much screams autumn, I decided brown butter squash would make for a great Thanksgiving side dish. It’s easy, it’s wholesome, it’s comforting. And that bit of sage sprinkled in? That seals the Thanksgiving deal. I don’t know about you, but all I have to do is smell a bit of sage and I’m immediately transported to Thanksgivings past. Owen and I are eating the squash that is pictured for lunch today. He’s gobbling it up. Pun intended. In fact, I’m going to see how many times I can use the word gobble before Thanksgiving arrives…get ready! Heat a medium-large-ish skillet over medium heat. Add butter and whisk until butter browns. Here’s what will happen”¦the butter will melt, then it will start to bubble, then it will really start to bubble and foam, then that bubbling and foaming will stop (although there will still be residual bubbles) and THEN the butter will brown. Take it off the heat at this point – you don’t want it to burn. This whole process takes about 5 minutes. Whisk in the sage, then add the cubed squash to the pan and toss to coat in the butter. Return the pan to the heat, heat the pan back up to medium, then turn the heat down to medium-low, cover the pan and cook until the squash is soft. This will probably take about 5-10 minutes. Once it’s the consistency you want it, take the lid off, sprinkle with salt & pepper to taste, carefully stir and flip the squash to coat, let cook 1-2 more minutes, then transfer to serving dish. Be sure to pour all that yummy browned, seasoned butter over the squash because, darn, that is some good butter. Probably about 4-6 servings if used as a side dish. Feel free to use more squash, just up the amount of butter and spice accordingly! 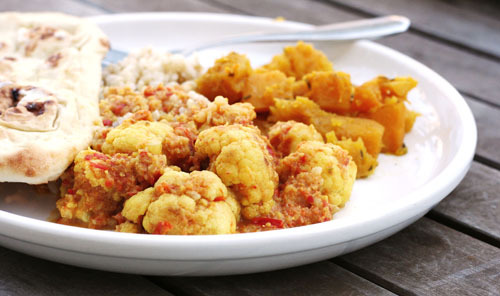 Preparing for La Petite Soirée…and a lunch filled with curry and veggie goodness! Doesn’t this food look good? It is. And I’ll get to it in a moment…but first, a little about what I’m up to this week! On Friday, I’m heading up to the BlogHer Food conference, and that night I’m also co-hosting La Petite Soirée, a party for food bloggers. I will be co-hosting this little shindig with some amazing fellow bloggers: Helene Dujardin from Tartelette, Kristen Doyle from Dine & Dish, and Stefania Pomponi Butler from City Mama and Clever Girls Collective. It’s been a dream team, no question. Did I mention, our party is going to be awesome? For food, we’re going to have a bunch of San Francisco food carts serving their delicious eats, and Chef Elizabeth Faulkner of pastry and Top Chef fame will be making cupquettes for the party (thanks to Scharffen Berger! ), served alongside wine and drinks. The party is going to be held at a photography studio, which is the perfect venue for a bunch of camera-toting food bloggers! Speaking of those bloggers…we have an amazing guest list, with really talented and wonderful food bloggers and cookbook writers included. I’m giddy with excitement! I always end up killing myself stuffing bags for all the parties I throw…La Petite Soirée is no exception! In fact, swag for the bags has completely taken over my patio and garage. And my back hurts a little. But it’s worth it! Here’s a little sneak peak. One of the best parts of getting into blogging is the truly amazing people I’ve befriended along the way. Gudrun Enger from Kitchen Gadget Girl definitely falls into that category. I met Gudrun at BlogHer in Chicago last year and, lucky for me, she only lives 2 miles away! She took pity on me today and came over to help organize and stuff swag. Not only did she help me tremendously with party preparations, she brought me lunch! She kept saying, “It’s just leftovers.” But, uh, yeah, her leftovers ROCK and way kick my usual peanut butter and honey’s sandwich patootie. Which brings us to the food from the beginning of this post. 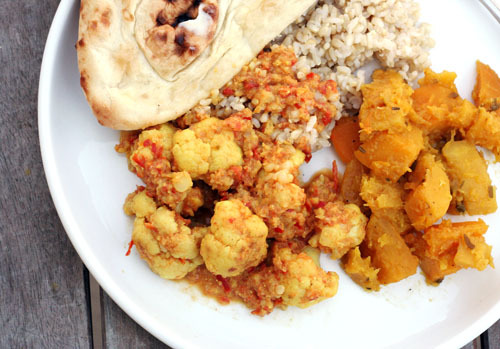 Gudrun brought Cauliflower Curry, a Delicata Squash and Pumpkin dish, brown rice and naan bread. Mmmmmm. Gudrun is one of my cool friends who is part of a CSA and does a great job using up all the fresh grown food she receives each week. I’ll get there…one day! Click more to see the recipes from my delicious lunch! Heat olive oil in large sauce pan until almost smoking, and saute the cauliflower florets until lightly browned. Remove to a bowl. In a food processor, process the cauliflower stems, onion, ginger, garlic, and Serrano until finely chopped, almost a puree. Transfer to a bowl. Do the same with the tomatoes, transfer to separate bowl. Whisk yogurt, water and nutmeg together until smooth. In the same pan you used to brown the cauliflower florets, cook the cauliflower stem/onion mixture until lightly browned, about 10 minutes. Stir regularly. Add in tomatoes puree and cook until most of the juice has evaporated, up to 10 minutes more. Add in coriander, cumin, garam masala, turmeric and salt and pepper, and bring to a simmer. Add in yogurt-water-nutmeg liquid with ½ the cilantro and bring back to a simmer, stirring constantly. Reduce heat to medium low, add the cauliflower florets, cover and simmer until the cauliflower is cooked to your liking (I kept it a little on the al dente side). Finish the dish with remaining cilantro and another sprinkle of garam masala. Great over rice! If using delicata squash, peel it with a vegetable peeler, cut it lengthwise in half, and scrape out the seeds with a spoon. Cut each piece lengthwise in half again, then crosswise into ½-inch -thick slices. 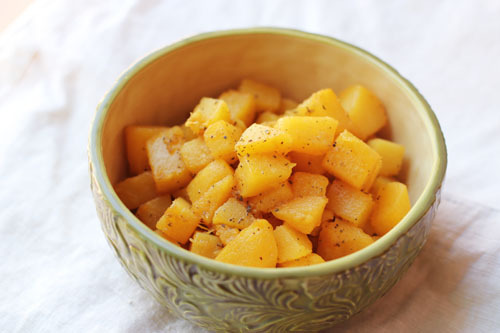 Other types of squash should be peeled with a chef’s knife, seeded, cut into 1-inch wedges, then sliced ½-inch thick. Melt the butter in a large (12-inch) skillet over low heat. Add the sage and rosemary and cook, stirring, until the butter just begins to turn golden brown, 3 to 5 minutes. Do not brown the herbs. Cooking the herbs in butter mellows their flavor and improves their texture. Add the squash to the skillet, then the apple cider, water, vinegar, and salt. Cook, stirring occasionally, over medium heat at an even boil until the cider has boiled down to a glaze and the squash is tender, 20 to 30 minutes. Taste and season with pepper, and additional salt if needed. 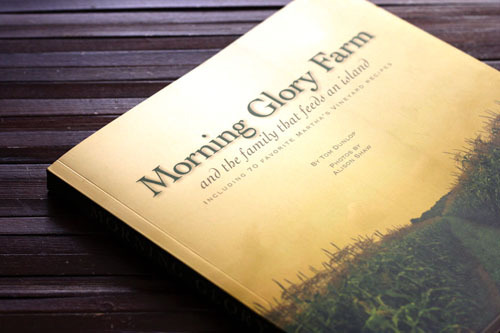 ‘Morning Glory Farm’ Cookbook Giveaway Winner…and a recipe! Congratulations to Pam, who said, “I’ve always wanted to go to the cape but have not had the opportunity. Would love a new cookbook from the area.” I hope you enjoy your copy of Morning Glory Farm, and I promise it’s going to make you want to get to the Cape and Islands as soon as possible, Pam! For the rest of you, I highly recommend you buy yourself a copy. Here is the recipe I promised! It’s delicious…the sweetness of the fruit paired with the flavor of the shallots and the squash was really lovely. 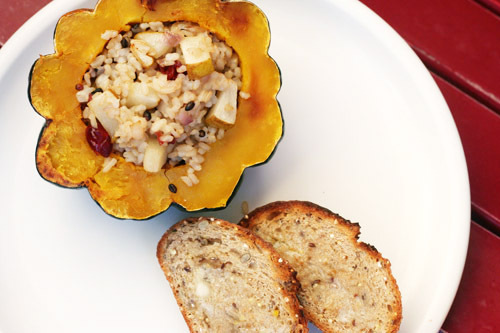 Oh, and I put a few pats of butter in the squash before I stuffed them with rice…mmmmm. Preheat oven to 375 degrees. Roast squash cut side down for 30-40 minutes. While squash is roasting, cook rice and wheat berries according to package directions (Jane note – I added salt to the water that the rice cooked in for flavor). 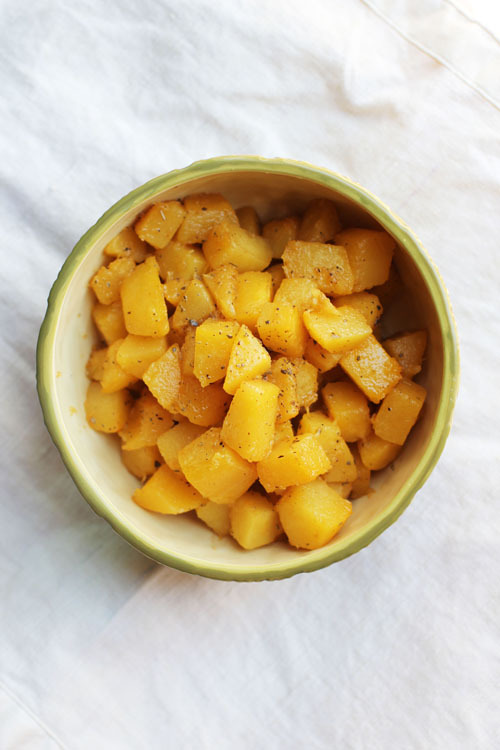 One squash is soft, cut pears into large dice and toss with ⅛ C canola oil. Roast on sheet tray about 20 minutes. Saute shallot in rest of oil over medium heat. Pour apple cider in with shallots, cooking and stirring to deglaze the pan. Mix rice, berries, pears, and cranberries into shallot mix. Salt and pepper to taste. Stuff each squash with filling and serve. Thank you to Vineyard Stories for a lovely giveaway! I’ve been a real slacker cook lately. I mean, it WAS my birthday after all. But I’m back in the kitchen and, as per Nate’s request, I’ve been trying new recipes more often lately. 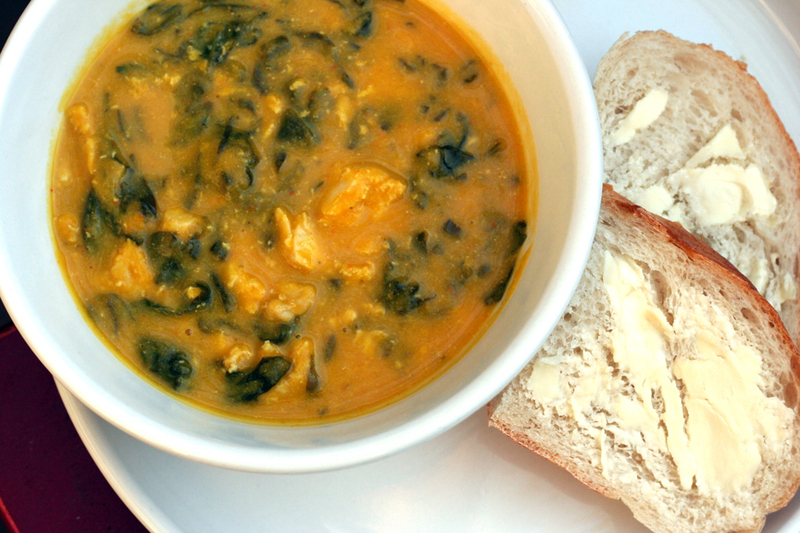 The latest experiment – Curried Squash and Chicken Soup, a recipe from my good friend Natalee. It was quite yummy and healthy to boot. And SO EASY. The only trick is finding the curry paste, which is usually at Asian markets. But seriously, even on a terrible, horrible, no good, very bad day, this soup added no extra stress whatsoever. A few quick notes. Nate commented it would be good on rice if it was a little thicker. I may try that – I’ll either cut the water or add a little cornstarch at the end. 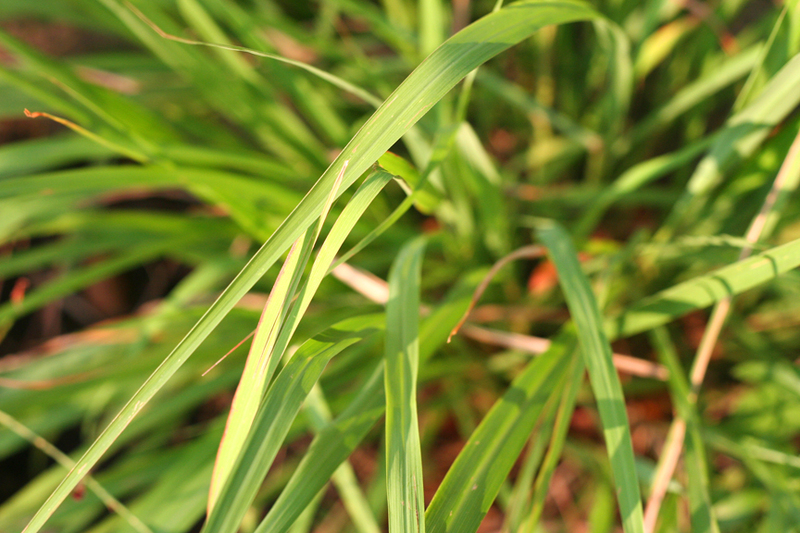 And, believe it or not, I have lemongrass growing in my flower garden! So, I threw a few whole blades of grass into the crockpot and pulled them before serving. It gave the soup such a great, fresh flavor! Without further ado, the recipe! Natalee’s favorite way to do this is in the crockpot because it allows all of the yummy Thai flavors to come out. Just throw it all in and cook on high for two or three hours–yummy! A great addition to this (but tricky to find anywhere except an Asian market) is LEMONGRASS!!! It is divine and makes it even that much better. 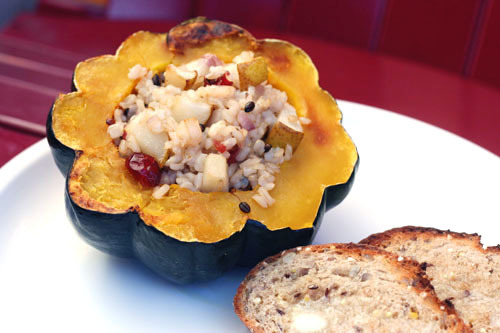 Yummy stuffed and baked winter squash!